Planning an oak frame building? Looking for a specialist builder with oak frame experience? Look at DJT Building for stunning oak frame building design! 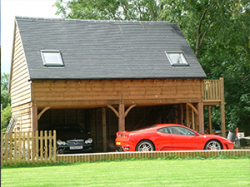 DJT Building provides a wide range of high quality oak frame building services throughout Cheshire and Staffordshire. 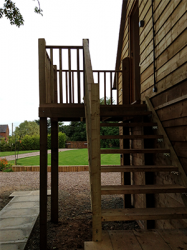 Our team are specialists in designing and building oak frame buildings, a beautiful, cost-effective and speedy solution to add extra living space or work space to your property. Established for over 10 years, we're a small family run business that takes great pride in offering all of our clients a consistently high level of service. We offer free, detailed estimates to ensure you are completely happy with the plan and cost. 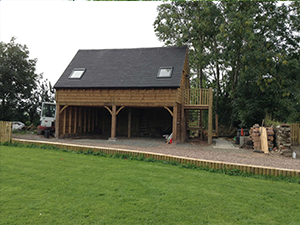 Timber frame buildings can be tailored to suit any purpose - from added living space, to an office or storage. Please call on 01630 647801 to discuss your ideas, we look forward to talking with you. Are you building a new timber property? Do you want an experienced timber frame building team? Check out DJT Building for timber building work at competitive prices! DJT Building provides a wide range of high quality timber frame building services throughout Cheshire and Staffordshire. We have great experience with timber frame new builds. Timber frames offer a fast, eco-friendly and highly insulated building solution for people wanting to add attractive, usable space quickly to their home or property. Adding a new timber building to your home can only increase living and storage space, it can increase your property value. A timber framed building can reduce build times compared to other building methods, meaning your construction project can be completed faster. Whether you need a new garage or home office; be sure to give Sue or John a call on01630 647801, we look forward to hearing from you.